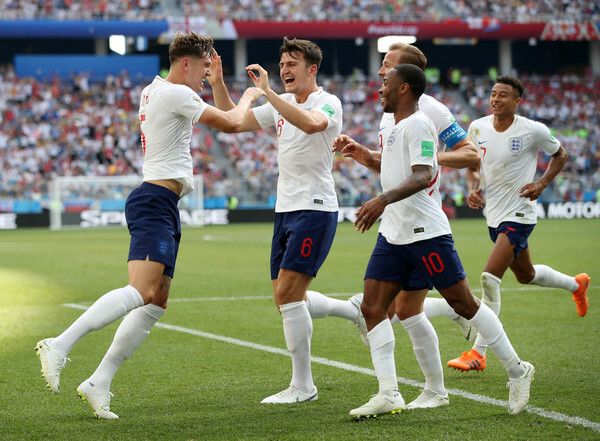 John Stones of England celebrates with teammates after scoring his team's fourth goal during the 2018 FIFA World Cup Russia group G match between England and Panama at Nizhny Novgorod Stadium on June 24, 2018 in Nizhny Novgorod, Russia. England book their place in the next round of Russia 2018 World Cup with a resounding victory over Panama. Tottenham Hotspur striker Harry Kane scored a hattrick while John Stones also scored a brace for the three Lions, Jesse Lingard was also on the scoresheet as the Manchester United winger scored a brilliant goal. Felipe Baloy pulled one back late in the second half.